One of the old amazing stop-motion animation techniques we used to learn in school is the claymation. In this technique, the artist sculptures animation characters and scene using colored clay and other supportive materials, each change in the animation frames is applied on the clay character by modifying it. Then, the artist takes still shots using either digital or film camera for each change in the scene. The still images sequence is imported in animation software such as After Effects to create the full animation. Dblg creative studio inspired a unique project that implements the same claymation technique, but this time using 3D printing technology. 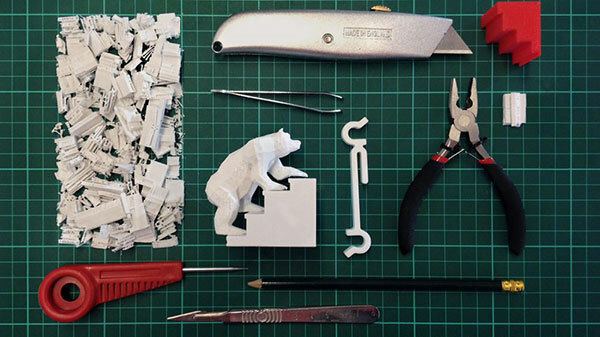 The idea behind the project is to create a stop-motion animation using 3D printed objects. 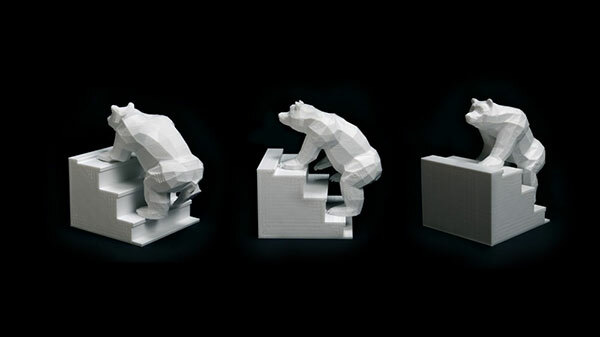 So, the team started to 3D model a bear character going up stairs. 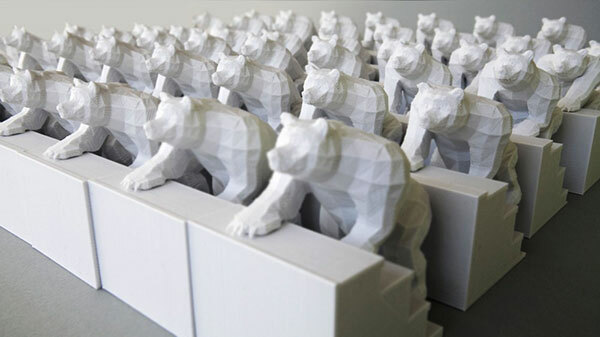 Each change in the animation frames is created and 3D printed to produce 50 polygons bears. The 3D printing process that took 4 weeks produce large set of frames. Each frame is placed in front of a digital camera and photographed, the next frames are places in the same exact position and photographed as well. In a similar technique like the claymation, image sequence is imported to animation software to produce the full animation. The below video show the Bear on Stairs stop-motion project and includes quick making overview to demonstrate how the team in Dblg worked to create the project. Cleaning and modifying the bear frames manually. The bear 3D printed frames with different view angles.